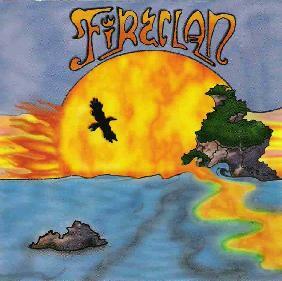 Fireclan - "Sunrise to Sunset"
Ever wonder what happened to Melting Euphoria? The last I knew of them was when I saw them perform at the Strange Daze 1998 Space Rock Festival. Original keyboardist Don Falcone has been covered extensively in Aural Innovations, with his Spaceship Eyes, Quiet Celebration and Spirits Burnings projects, but I've not been aware of what the others have been up to. Fireclan is a new band featuring x-members of Melting Euphoria: Mychael Merrill on drums, Luis "Zero" Davila on keyboards, and Don Falcone on bass (Davila replaced Falcone on keyboards in Melting Euphoria when Falcone left the band). And as a bonus we've got the great Daevid Allen contributing guitar to two tracks. "Sudden Mist" is another killer space symphonic rocker, beginning with a Pink Floyd-ish feel, but quickly launching into a full blown assault of mind-bending space-prog keyboards and battle ready bass/drum rhythm section. "Winds Of Sorrow" is a 14+ minute exploration that includes more Floydian influences and assorted other 70's sounds.... all deeeeeep in space. "Riding The Shaman's Drum" is quite different, being a percussion dominated ethnic/tribal/trip-round-the-campfire groove number. For completely mind expanding lush cosmic symphonic keys you can't top "Beyond The Mountain Top". Get out the crystals and pyramids because this track is just as physical an experience as it is cerebral. And one of the hottest rockers of the set is "Cliff Of Fate", a nearly 12 minute out-of-this-galaxy rocker with shimmering efx, totally spaced out vibe, a fiery rockin' rhythm section and passionate cello lines from Kirk Heydt. Excellent. Finally, "Acoustic Sunset" closes the set on peaceful note, with more cool cello work from Heydt. In summary, this is an outstanding set of mind expanding space rock that takes the legacy of Melting Euphoria in new and exciting directions. Highly recommended. For more information you can visit the Fireclan web site at: http://www.home.earthlink.net/~falcone/fireclan.html. Email at mychaelmerrill@comcast.net or nohpoetry@earthlink.net. Contact via snail mail c/o Noh Poetry Records; 1272 Jenevein Avenue; San Bruno, CA 94066.